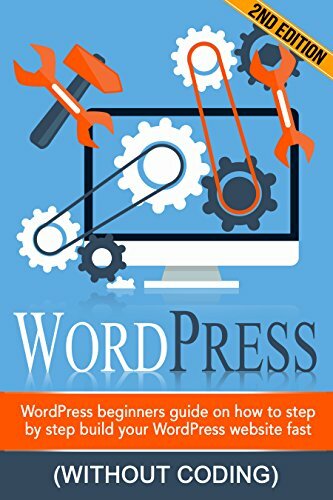 [PDF] WordPress: WordPress Beginner's Step-by-step Guide on How to Build your Wordpress Website Fast (Without Coding)(WordPress for beginners, WordPress For dummies, WordPress Development WordPress) | Free eBooks Download - EBOOKEE! Description: With WordPress, anyone can make a professional website with trifling computing knowledge. â€œBeginners guide on how to step by step build your website fastâ€ is an easy-to-follow, no non-sense guide to WordPress - the world's most popular website building tool. No Coding Knowledge Required: You need absolutely no prior coding knowledge. The basic day-to-day computer instinct that you have already mastered, such as opening websites and browsing, are good enough to get you going and bringing in great results. Results in 1 Days: In about 1 days, we will partner with you in creating your dream website. A Complete Guide: You will learn to- â€¢	Register your domain and host your website â€¢	Design a super professional website with WordPress â€¢	Learn all about â€˜hotâ€™ WordPress themes, plugins, widgets and tools â€¢	Add and format content â€¢	And much, much more We know you have innumerable book options, and online and offline training courses to choose from. But, if you are looking for something that is super-simple, can help you get results in the comfort of your home in as less than 2 hours, and deliver a website you can start flaunting within 5 days, then this book is for you. â€œBeginners guide on how to step by step build your website fastâ€ is your guide to the easiest and fastest way to creating your WordPress website or blog. Here Is A Preview Of What You'll Learn... How to setup your WordPress website properly How to choose the right niche How to setup the right theme Must have plugins Create menus for your website The right hosting for your website Much, much more! 2018-01-29[PDF] Discover how to build your first website! 2017-10-25[PDF] How to Build your Business Website and Email the fast way! 2018-01-29[PDF] How to Make a Website for Beginners: Learn How to Make Your Own Website from Scratch with WordPress! No comments for "[PDF] WordPress: WordPress Beginner's Step-by-step Guide on How to Build your Wordpress Website Fast (Without Coding)(WordPress for beginners, WordPress For dummies, WordPress Development WordPress)".